Dalfampridine extended-release (ER) tablets 10 mg BID have been approved for use in improving walking in people with multiple sclerosis (MS). This subgroup analysis evaluated the effects of dalfampridine ER 5 and 10 mg BID on distance walked, as assessed using the 6-minute walk (6MW) test. This analysis of data from a randomized, placebo-controlled, double-blind study (N = 430) included only the 153 patients with 6MW data available. Participants (aged 18–70 years) were randomly assigned in a 1:1:1 ratio to receive dalfampridine ER 5 or 10 mg or placebo, BID for 4 weeks. The 6MW was used for assessing walking distance at baseline and 2 weeks after the start of treatment at the 26 study sites that were able to perform this test. 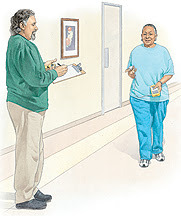 Participants were administered the 12-item MS Walking Scale (MSWS-12), a patient-reported measure of the impact of MS on walking. Post hoc outcomes included the percentages of patients who achieved an increase from baseline in 6MW distance of ≥20% and who achieved a minimal clinically important difference (MCID) from baseline in 6MW distance, defined as ≥+55 m. Changes from baseline in walking speed (MSWS-12) were compared, stratified by subgroup that achieved ≥20% versus <20% improvement on the 6MW. The correlation between change in walking speed over time and subgroup (by change in distance walked) was evaluated. The tolerability of dalfampridine was assessed based on the prevalence of treatment-emergent adverse events (TEAEs). In the post hoc analysis, the percentage of patients with an improvement in 6MW distance that met or exceeded the MCID was significantly greater with dalfampridine ER 10 mg BID relative to placebo (37.3% vs 12.2%; nominal P = 0.004). Similarly, the percentage with an improvement in 6MW distance of ≥20% was significantly greater with dalfampridine 10 mg BID relative to placebo (45.1% vs 14.3%; nominal P < 0.001). Regardless of treatment allocation, improvement in MSWS-12 was significantly greater in the subgroup that achieved a ≥20% improvement on the 6MW compared with the subgroup with <20% improvement (mean changes, –15.5 vs –7.2; nominal P = 0.041). The prevalences and types of TEAEs were consistent with those reported in previous studies. Based on the MCID for 6MW, the use of dalfampridine ER 10 mg BID but not 5 mg BID was associated with statistically significant and clinically meaningful improvements in walking relative to placebo. The correlation between improvement on MSWS-12 and the 20% increase in 6MW distance suggests that an improvement on MSWS-12 is clinically relevant. These results, although highlighting a lack of efficacy of dalfampridine ER 5 mg BID, suggest that the 10-mg BID dose is effective for improving walking speed, as observed on short timed-walk tests, and for increasing distance walked over longer timed-walk periods. ClinicalTrials.gov identifier: NCT01328379.